Nick Charles hails from Down Under but dazzles audiences the world over with his sleek fingerstyle guitar playing and songwriting. His latest solo acoustic guitar CD demonstrates once again why Nick is so often called Australia's virtuoso of acoustic roots guitar. 17 tracks featuring a couple of covers (the Beatles "I Will" and the completely surprising solo version of the international smooth jazz hit by Candy Dulfer and David A Stewart "Lily Was Here") along with a large slab of Nicks original mix of blues, ragtime and jazz originals! 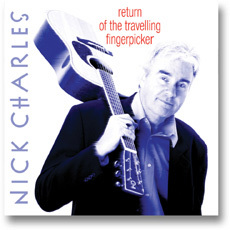 Australian fingerpicker Nick Charles satisfyingly delivers 17 solo pieces for acoustic guitar on his latest Solid Air release, "Return of the Traveling Fingerpicker." As he says on his liner notes, this collection is "just one guitar all the way, no trickery, no stomps, only sore fingers and worn-down nails." The result is a warm and intimate recording that places listeners in an aural space seemingly in Charlesâ€™ lap. Charles, who started playing guitar at age 15, presents 13 originals, three covers and a traditional piece. 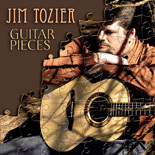 Though he leans most comfortably toward the blues, he slides easily into and out of ragtime, pop, Americana and jazz. While his rhythm and technique are impeccable, two aspects of his work stand out: a deceptive ease of playing and an unerring sense of melody. Clearly, each song exists as a living entity, a story to be communicated. The wistful "Paulâ€™s Song," with its sweet ache, pays homage to someone who must be quite special; "Lullaby for Hamish" is another sweet one, while "Lily Was Here" is heavier, the E string throbbing almost like a drone, while "December Rag," "Silent Movie" and "Meditation Rag" bounce jauntily along. While most of the playing is done on his six-string acoustic, Charles brings out his steel-bodied Dobro for the rich tones of "Kelpie Blues," complete with a couple of rather startling rattles. His on-target take of Lennon/McCartneyâ€™s "I Will" sounds like gossamer and lace, while the so-tasty-you-want-to-eat-it, most purely enjoyable track, "Pecan Pie Blues," joyously celebrates Americaâ€™s most original art form. Charles lovingly caresses "Las Cruces," a classic just waiting to be discovered. But the roots-oriented virtuoso saves his best for last: a masterful and beautiful reading of Jerome Kernsâ€™ 1930s jazz standard, "Yesterdays." Just lean back and let this one wash over you. This collection is a most enjoyable "Return."